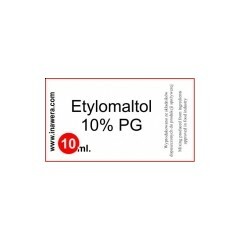 ETHYL MALTOL 10% PG solution﻿. This ingredient is used to strengthen the taste of your e-liquid. Especially recommended for fruit aromas. Start with adding 1 drop per 5 ml of your e-liquid. This ingredient is used to strengthen the taste of your e-liquid. Especially recommended for fruit aromas.